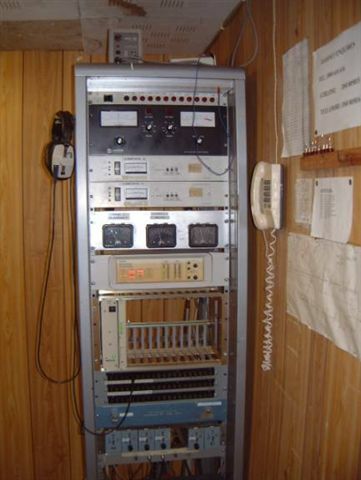 RTE – Radio Telefis Eireann. 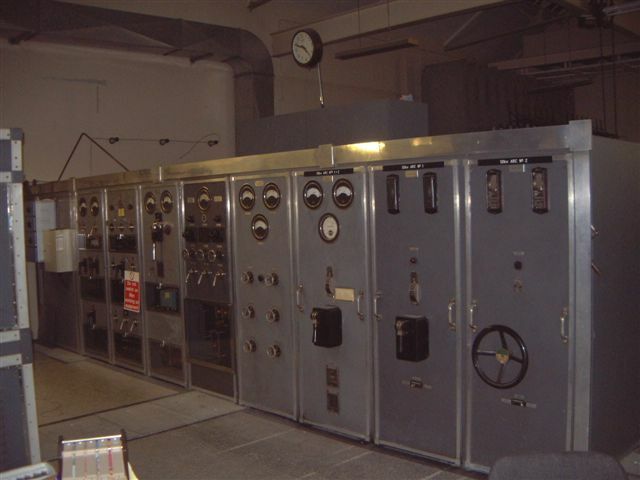 Radio Eireann’s famously-located Athlone transmitting station started operating in February 1933, with a 100kW Marconi transmitter. 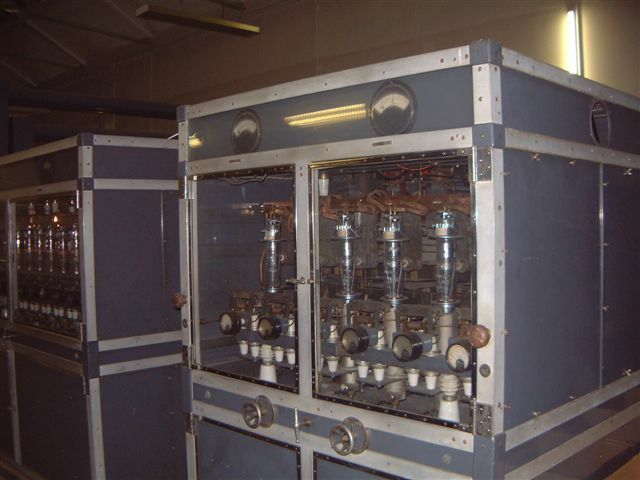 This amazing piece of work operated until the late 50s, when it was replaced by a Brown-Boveri unit, also 100kW. pop music service, 'Radio 2' started in 1979. 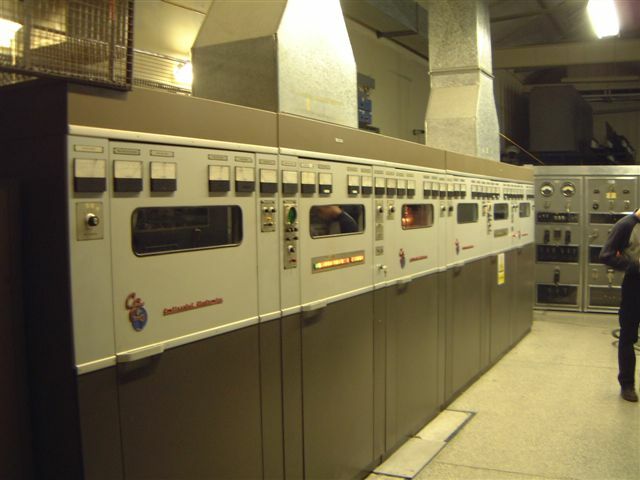 This was, and still is transmitted from Athlone with a Continental Electronics 100kW transmitter. The antenna is a T, between two approx 300-foot towers. 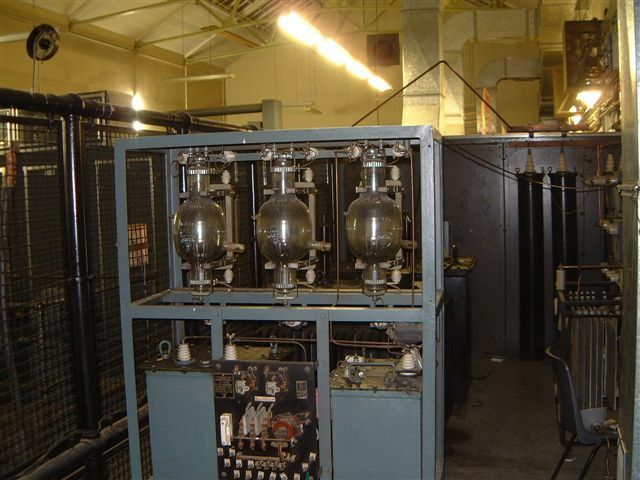 Incredibly, both the original Marconi and the Brown-Boveri transmitters are still in situ! We had a tour of Athlone last week (24th Nov 2003) and took these pictures of this amazing place. Pictures reproduced below, with captions where we knew what was what. There is no guarantee of the accuracy of these captions! 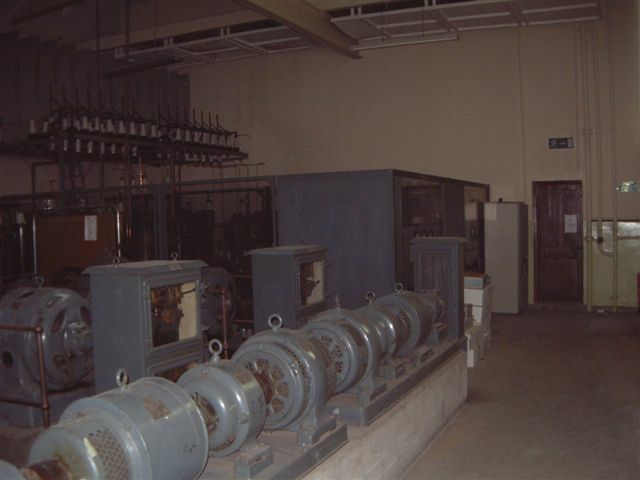 All three transmitters are contained in one large hall. 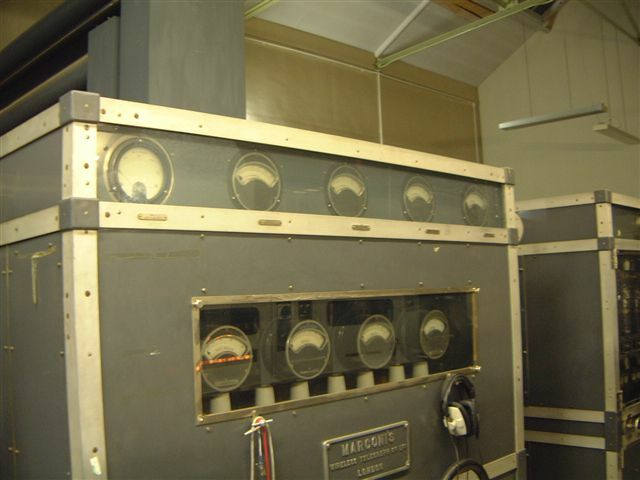 The building was obviously constructed especially for, and probably at the same time as the Marconi transmitter. 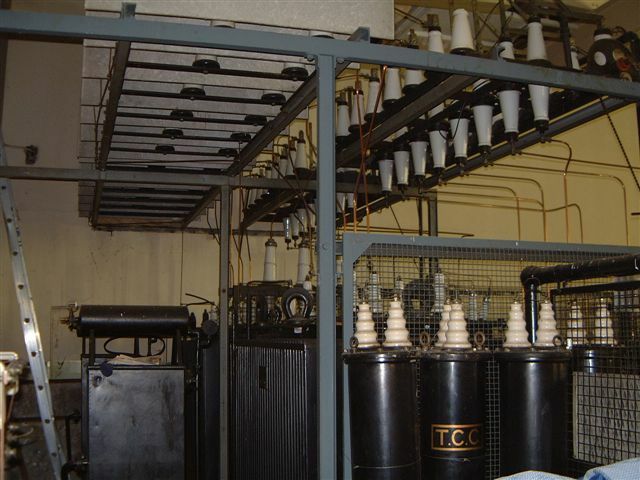 This picture is of one end of the hall, containing the power supplies for the Marconi. 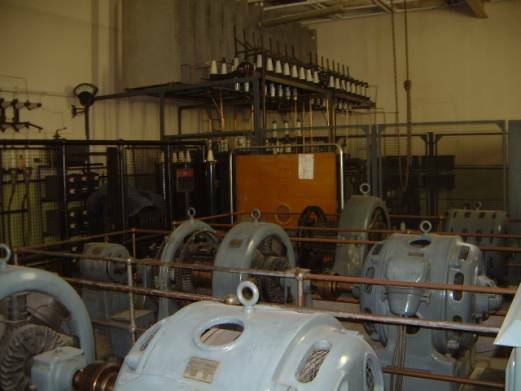 Here are a few of the rotary transformers used to generate high voltage DC – a motor driving a dynamo! 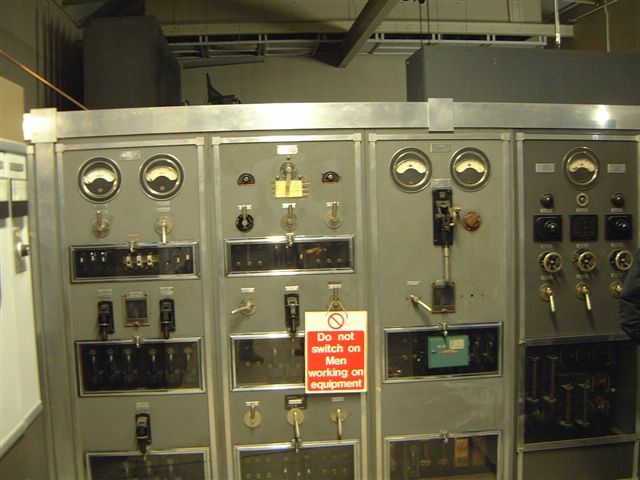 In the background of the right picture there is the PSU enclosure for the Brown-Boveri transmitter. Close up of some of those rotaries. Imagine the noise when this lot was running! 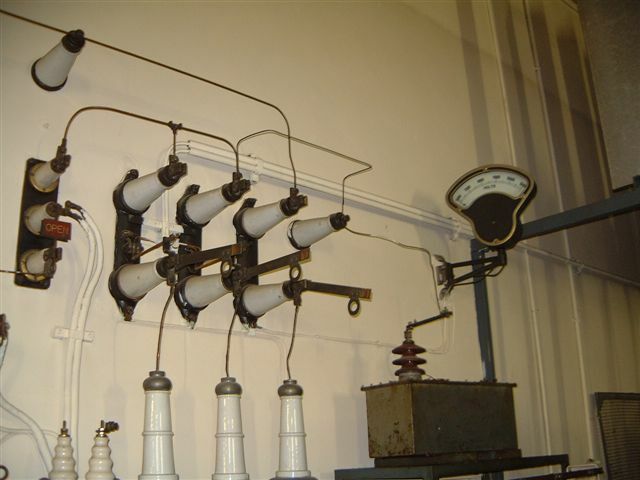 Lovely wall-mounted switches, with that great volt meter sticking out. 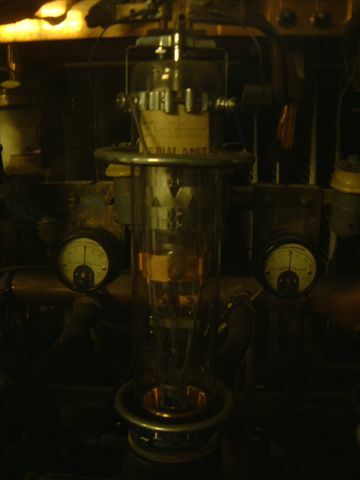 Capacitors and transformers in background. Not sure of the PCB status here! 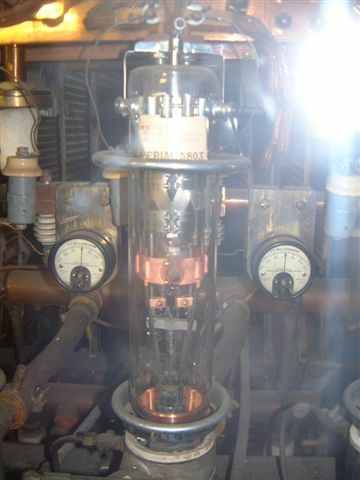 Rectifier tubes. 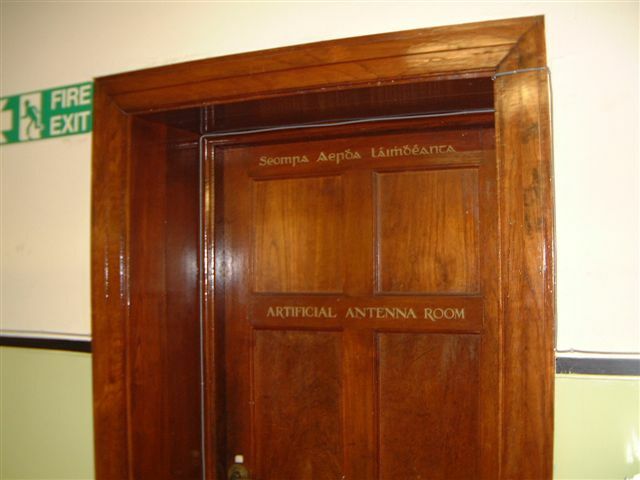 My colleague Andy Green chats to RTE's Tom Mollens, who showed us around.As you walk into the door of the hall, this panel is to your left. I don't actually think there were men working...! This is one of three cabinets that run perpendicular to the ones above, and opposite the new Continental. Not exactly sure what they do. Notice the way the plaque uses the posessive form of the manufacturer's name. I guess the headphones (Beyer DT100) aren't original! Second cabinet of the three. Any guesses what these tubes are? It was hard taking a close-up through the glass, so here are two shots, one with flash, one without. Third of the three cabinets, again filled with exotic tubes. 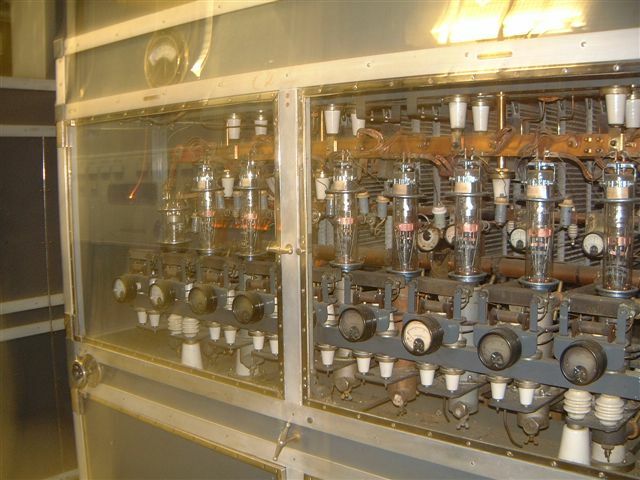 On the right is another shot of the main line of cabinets. 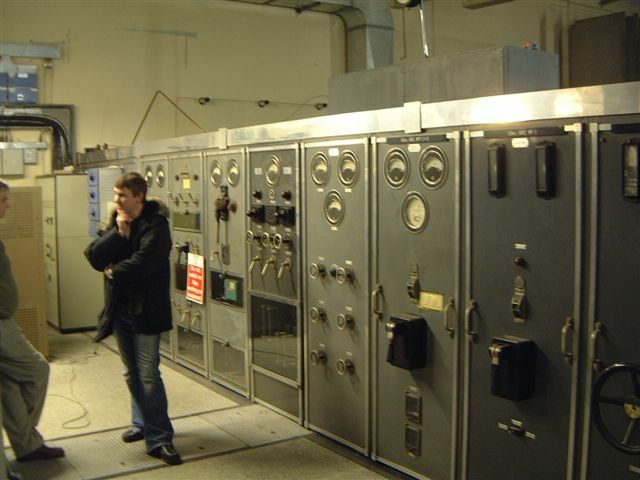 We didn't actually see anything that looked like a large modulation transformer anywhere, so we assume the rig was modulated relatively low down and the rest was a linear amp up to 100kW. 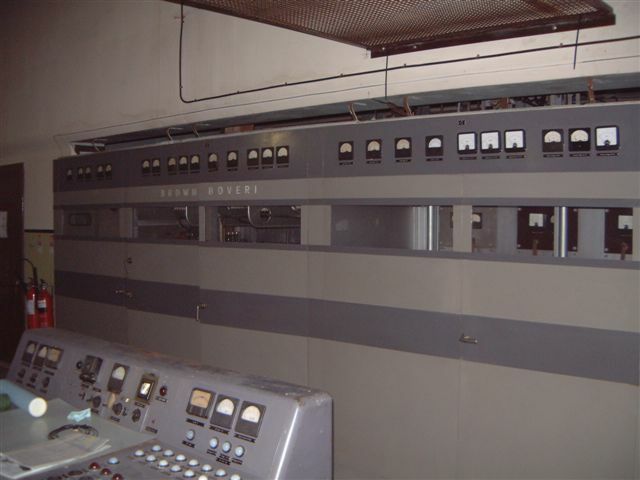 Now the Brown-Boveri transmitter. We were only shown access to the front of this. 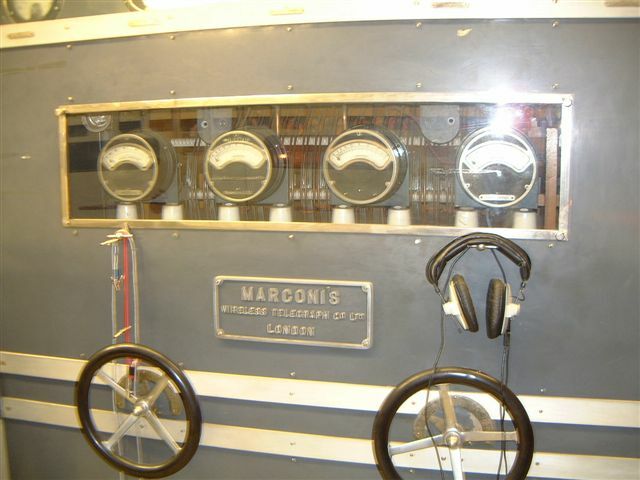 It is located parallel to the Marconi's main line of cabinets, about 30 feet away with the Marconi tube cabinets and the Continental perpendicular and inbetween. 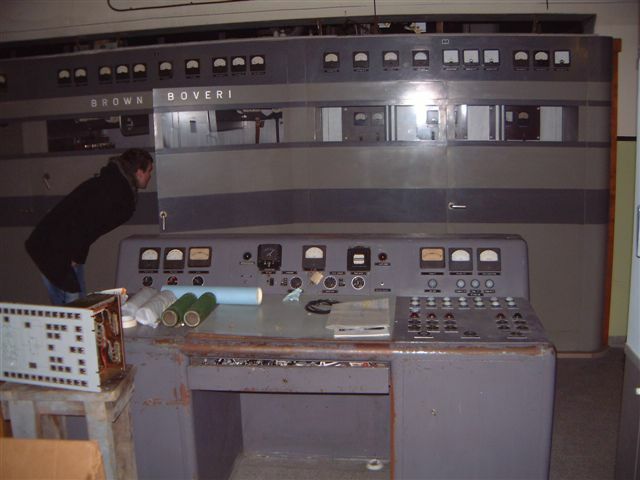 The BB's two power supply control panelsI presume the BB was two 50kW units. 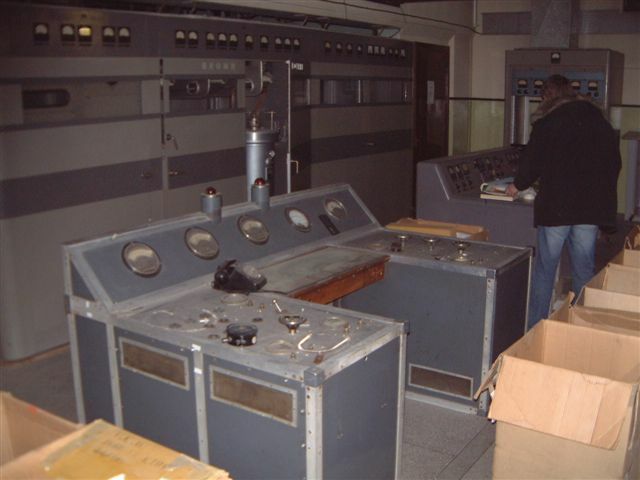 The two consoles, with Mr Green inspecting. I think the nearest one controlled RF. 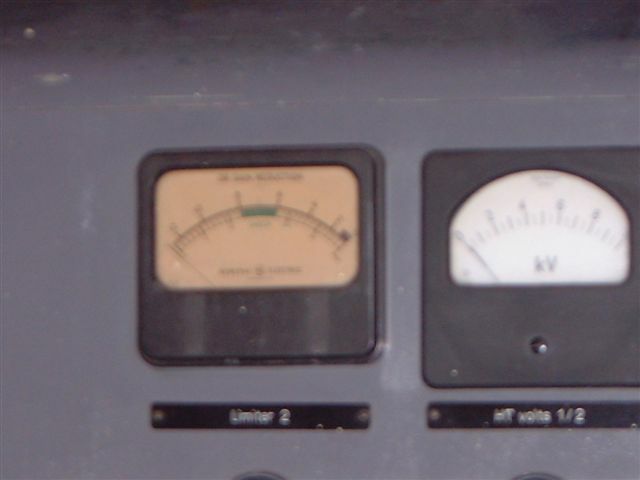 Reckon this is the console that controlled the modulation stages, as the yellow-ish meters are labelled 'limiter' 1 and 2, and other controls seem to refer to mod rather than RF. it's a bit difficult to take a full-frame photo of the Brown-Boveri as other bits of transmitter prevent you from standing far enough back! By the way, above that grating at the top is the feeder from the Continental out to the next room, which we didn't see. Three bars spaced vertically, center one aerial, top and bottom ones earth. Two 50kW units combined. 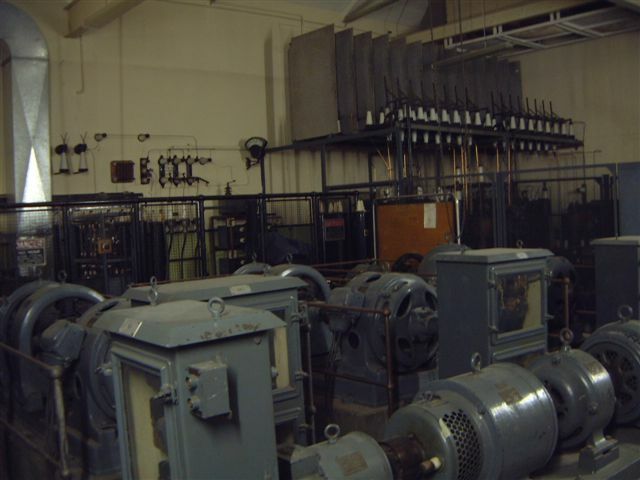 This day, the far-off section was off-air for maintenance. Left, the PIE (program interface equipment) rack; Yes they're still using Inovonics 215 processors! 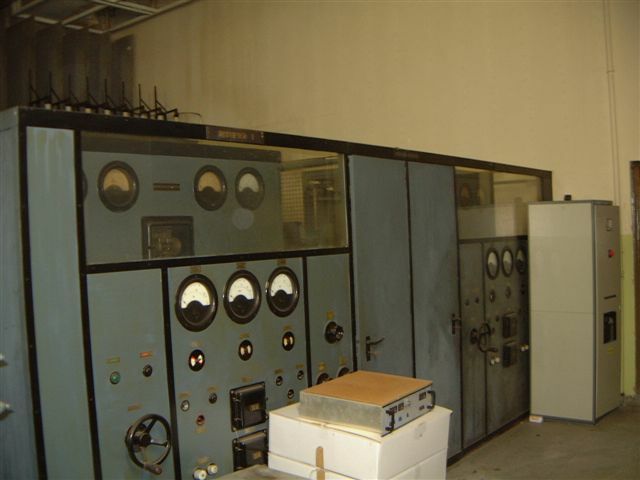 Right, the telemetry rack which monitors loads of parameters at this station and also, remotely, the Tullamore site where RTE Radio 1 comes from now. 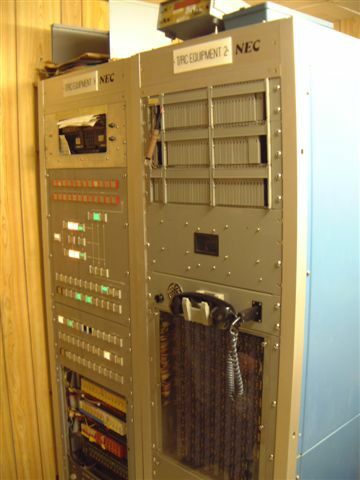 The plate beneat the telephone contains about 200 mechanical relays, all clicking in sequence about one a second. Apparently since this was installed in 1979, not ONE of these relays has failed! How quaint! Once the room that housed the Marconi's dummy load, now just a store. the load now is contained within the Continental's combiner cabinet. Thanks to Tom Mollens of RTE who very kindly showed us around. Sorry there are no shots of the building exterior or the antenna, but it was dark; I'll try to take some another time and add them.